National Homelessness Week is held from 6 – 12 August 2018 and the theme this year is ‘Ending Homelessness Together’. The week aims to raise awareness around the personal stories of people experiencing homelessness, the issues they face and the action needed to achieve enduring solutions. Homelessness Week is an opportunity for the community to work together to raise awareness of homelessness, with a number of events being held around the State. Help get the word out about Homelessness Week 2018! Share this calendar on Facebook or Twitter. If your organisation is holding an event for Homelessness Week and you would like to be included in the event calendar, please contact us. Come along to the launch of Homelessness Week 2018, and find out more about homelessness in Tasmania. Be part of the solution. Together we can end homelessness in our community. Colony 47 will reveal the locations for a week-long soundscape to be held across the Hobart, Glenorchy and Clarence municipalities, sharing the voices of those at risk of, or experiencing homelessness. See the event flyer or free call 1800 265 669 for more information. For more information, please contact Colony 47 on 1800 265 669. Youth, Family & Community Connections Annual HELP Short Film Festival aims to increase community awareness of relevant and complex issues. The Theme for the 2018 HELP Film Festival is “Stereotypes” in relation to Youth homelessness and/or Youth alcohol and other drug usage with a focus on positive solutions. Young Tasmanian film makers aged 12-24 were asked to produce a short film for entry to the festival. The selected films will be screened during National Homelessness Week on the evening of Monday 6th August at CMAX Cinema in Devonport. For more information, please contact Cassie at YFCC on 03 6424 7375 or cassie@yfcc.com.au. All are welcome, however please note: this is not a media event. All Round Health and Community Care will be holding a drop-in health clinic focusing on education and awareness to the general public regarding homelessness. The clinic will be providing diabetes, blood pressure and respiratory checks as well as the chance to discuss any general health concerns. Handmade soap will be available to buy, raising much-needed funds for “The Street Clinic” program. Research undertaken overseas has highlighted that socks and soap are two things that someone who has found themselves sleeping rough value. A Paw Up will also be at the clinic, an organisation that helps feed and care for the pets of Tasmanians who are homeless or facing homelessness. For more information, please contact David Patras at All Round Health and Community Care on 03 6236 9016 or dpatras@roundhealth.org.au. CatholicCare Housing Connect staff will be assisting with preparing and serving lunch for the community, including delicious deserts donated by CatholicCare. ‘Men’s essentials’ toiletry bags will also be distributed on the day. For more information, please contact Jo on 03 6431 8555. It is becoming more difficult to secure affordable and appropriate housing in Hobart. There are increasing reports of people having trouble accessing permanent and safe accommodation and that this lack of access to affordable homes and rentals has led to higher levels of couch surfing, overcrowding and homelessness. Please join us at the Town Hall for a conversation around current evidence and experience in the community, recent research data and changing demands. Together, let’s find solutions to end homelessness in our community. Those who cannot attend in person can watch the forum live via this link. Presented by the City of Hobart, in conjunction with Colony 47 and the Institute for the Study of Social Change (UTAS). For more information, please see the event poster, the Hobart City calendar or contact Danielle Walker at Hobart City Council on 03 6238 2772 or walkerd@hobartcity.com.au. Join us to explore “Issues & Solutions” around homelessness. This event will be held on both Wednesday the 8th and Thursday the 9th, with the same lineup each night. An innovative and collaborative way of working to enhance individual and community wellbeing. Centacare Evolve Housing have adopted the SIP framework as their community development model. Specific co-creative initiatives include Build Up Tassie, Neighbourhood Leadership Program and The Hub. 7:30pm to 8:00pm – Singer/Songwriter: Darvis Walker, performing “Black Bird” – an anthem for youth at risk. by Tasmanian artist and CatholicCare staff member Trish Verdouw. Inspired by her therapeutic work with individuals and families whose lives have been affected by homelessness and domestic violence, Trish will show some work from her collection titled “Behind Closed Doors”. There will also be an assemblage of audio and visual installations throughout the evening including soundscape and video portraits. 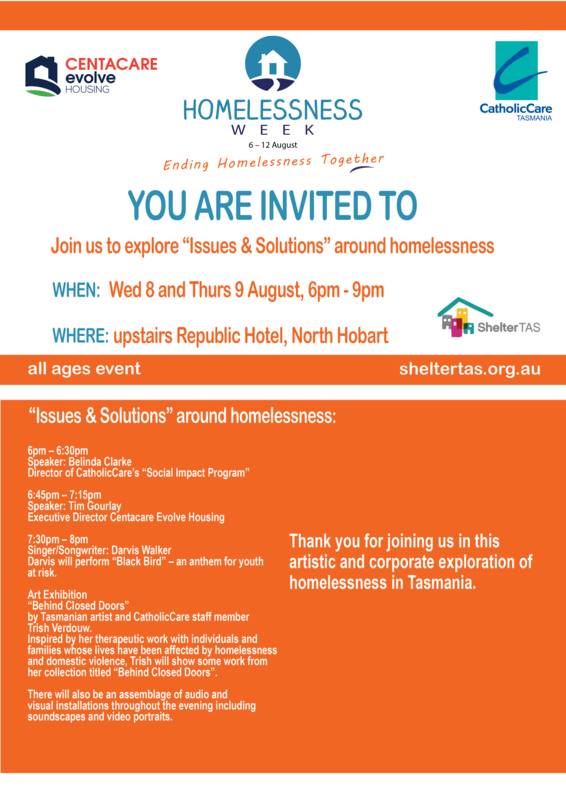 Thank you for joining us in this artistic and corporate exploration of homelessness in Tasmania. For more information, please see the event flyer or contact Denise Leonard at CatholicCare on 03 6278 1660 or denise.leonard@AOHTAS.ORG.AU. Vinnies will be distributing coats alongside Gran’s Van at the usual Gran’s Van stopping points in Devonport. For more information, please contact Maryanne Singline at Vinnies on 03 6333 0822. Magnolia Place Launceston Women’s Shelter will be holding a Community Awareness Stall as part of Homelessness Week. For more information, please contact Narelle or Marg at Magnolia Place on 03 6344 5322 or admin@lws.org.au. For more information, please see the event flyer contact Denise Leonard at CatholicCare on 03 6278 1660 or denise.leonard@AOHTAS.ORG.AU. Anglicare will be holding a Community Awareness stall at Launceston LINC. There will be a photographic display and quotes from people who have experienced homelessness. Information will be available on housing stress, renting and budgeting, showing the difficulty of renting on low incomes. Staff will be available throughout the day, and people will be invited to share their thoughts on homelessness and suggestions of what can be done to end homelessness. For more information, please contact Louise Bieser at Anglicare on 03 6333 3063 or L.Bieser@anglicare-tas.org.au. Bethlehem house will be hosting a BBQ for all members of the community in Franklin Square, Hobart. BBQ starts at 11:00am and will be available until 2:00pm or food runs out. For more information, contact Stephanie K Meikle at Bethlehem House on 03 6234 4594 or ceo@bethlehemhouse.org.au. YFCC will be hosting an awareness raising luncheon for local providers and community leaders. Anglicare will be hosting an art competition and exhibition at the Devonport Youth Facility. Students from local schools will create artwork to be exhibited at the Devonport Youth Facility starting Tuesday 7th of August, with prizes awarded at an afternoon tea on Friday 10th of August. For more information, please contact Liz Leslie at Anglicare on 1800 243 232 or lizl@anglicare-tas.org.au. CatholicCare Launceston will be distributing essential bags for men – Items will include but not limited to: toilet roll, shampoo, soap, face washer, deodorant, and water bottle. A Services list of where to access free/cheap meals and showers will also be included. Through this initiative we are hoping to make a small difference to the lives of those experiencing homelessness. This initiative also aims to highlight homelessness and the impact on those sleeping rough/couch surfing. Where: Bags will be distributed at Shekinah House hot meals night and St Vincent de Paul food van. For more information, please contact Maranda on 03 6332 0600. Karinya Young Women’s Service Launceston will be hosting an interactive display at Launceston College, running from Monday to Friday, engaging college students to add to the display ‘What home means to them’. For more information, please contact Ria Brink on 03 6331 0774 or karinya@kyws.org.au. During Homelessness Week, Fahan School Year 7 works for the 50/50 campaign will be displayed in the windows of the City of Hobart Customer Service Centre in Elizabeth Street. For more information, please see the 50/50 – Affordable Housing Awareness ART Campaign on Facebook. Homelessness Week is also linked to the national Everybody’s Home campaign. Shelter Tas proudly supports the campaign’s plan to fix the national housing system so that everybody has a home. To download the banner images, click or tap on each banner to see the full size image, then right click or tap and hold the image, and choose the save as or download option. Help get the word out about Homelessness Week 2018! Use the share button below to share this calendar on Facebook or Twitter.